EnglishSkills is an iOS app made primarily for students to improve their English listening comprehension and speaking ability at their own pace. It is based on the same principle as language lab training. That is getting used to a language, first by listening and second by repeating. 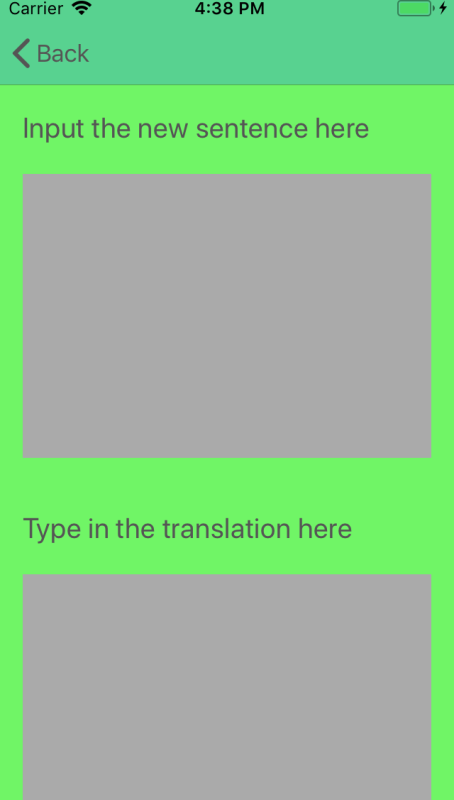 More than a hundred sentences are provided from the beginning in the full version of the app with a voice recording done by a professional narrator. This screenshot shows the main page of the app. Beside the standard contents, the app also provides the possibility for a user to add sentences of her or his own. 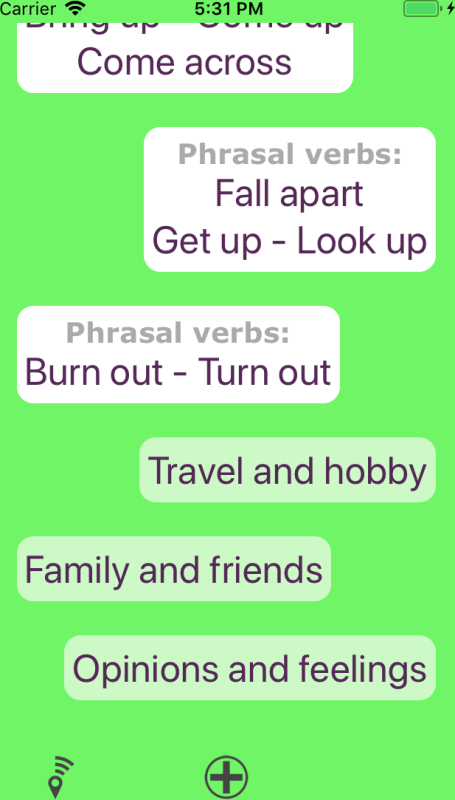 One can for instance ask a teacher or a native speaker friend to input and record some new phrases, by doing so expanding the app content to suit one's interests and ability. The beauty of this app is that it is easy for teaching professionals to create unique course materials for their students to use or simply as models to promote what they can teach. The app gives them the possibility to upload what they have created, making it available for students to download and use. Tapping the i mark at the upper right of the main page brings the information page of the app. This screenshot shows the information page. Scrolling down from the main page to the bottom will display something similar to this screenshot. One can see two little icons at the bottom: a + sign at the center and another one on the left. These are the tools with which the user can extend the app. 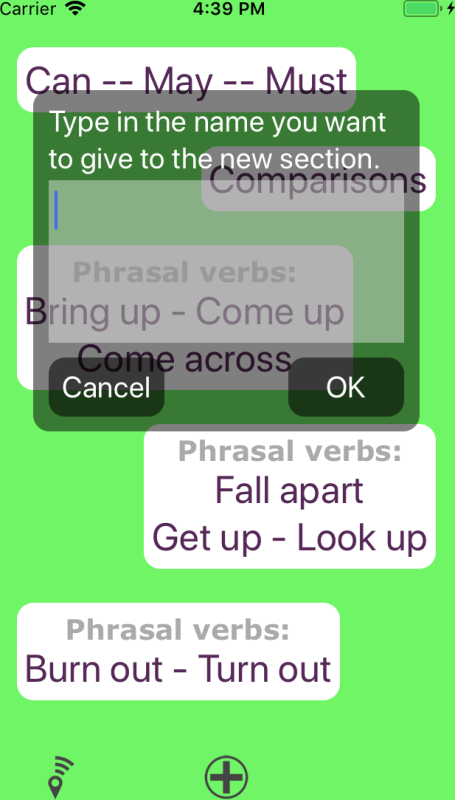 The center icon can be used to add new sentences to the app, and the left one to download sentences that some teacher has previously put online. The new sentences that one can add to the app are grouped into a new section called "Custom sentences" by default. One can also make a long press on the + sign and create a new section. As many sections as needed and as many sentences as desired can be added to the full version of the app, the only limit being the amount permitted by the memory available on the device. 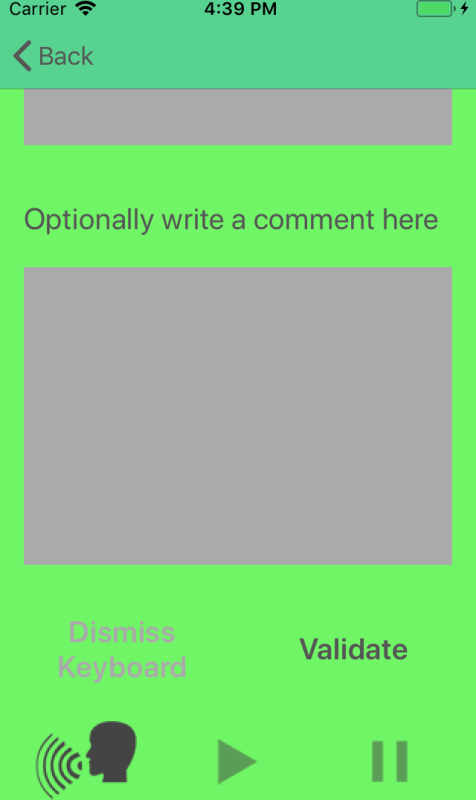 This screenshot shows the top part of the interface to input a new sentence into the app. A sentence (in English), its translation and possibly a comment or explanation can be provided. And most importantly a voice recording can (and) should be provided. This screenshot shows the bottom part of the interface. This screenshot shows the interface to input a new section into the app. A title must be provided. 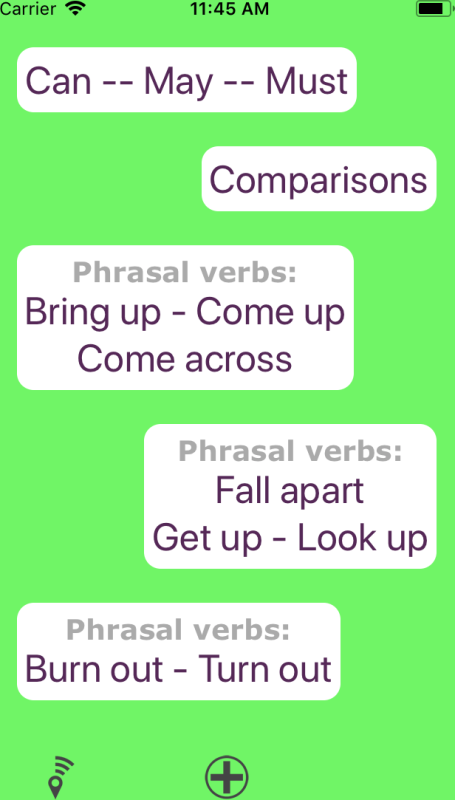 On this screenshot the user has added three sections of his (or her) own in order to store various kinds of new phrases. If he or she later decides to modify the title of one section (or delete the section), it is only necessary to make a long press on the title and an interface will appear allowing the user to edit the title or remove the section with its contents from the app. If you find that EnglishSkills has the right approach to language learning, related iOS apps for other languages can be found here.